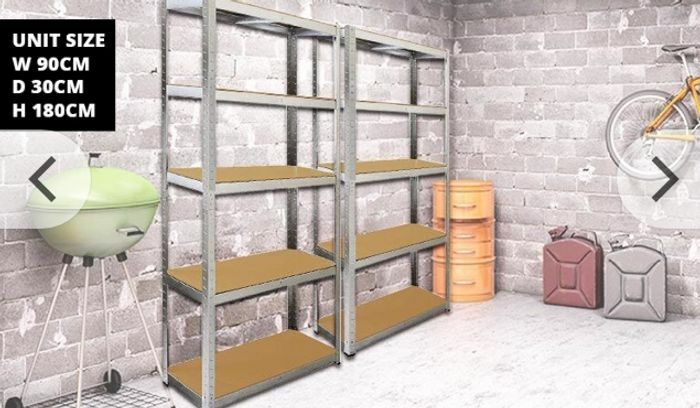 Get a two-pack of 90cm Galwix steel shelves! Made from 0.8mm thick galvanised steel and strong MDF boards. Each shelf able to hold 175kg of evenly-distributed weight. Five shelves per rack - each rack is able to hold up to 875kg! Moulded feet for a nicer finish and to add extra support. Measurements: (H) 180cm x (L) 90cm x (D) 30cm. What do you think of this Wowcher deal? I have got some shelves like these and they are so useful and this is a great price. These look like exactly what I need for my garage, what a bargain! Never are they £228. These were pointed out a couple of months back at £15 each. They are standard £18-20 each on eBay. Simple galvanised steel and MDF shelving. o1nk000 Thanks for letting me know! It's so annoying when companies do that! I appreciate you telling me! The price is not £34.99. It is £44.98 as you have to pay £9.99 to buy the voucher.